53rd St. & 6th Ave is the Chicken & Rice Capital of New York City. There will never be consensus over who makes the best, but there is no question about who is the most popular. 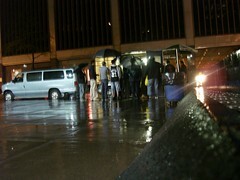 If you’ve passed 53rd St. & 6th Ave. after 8pm on any give night, then you’ve seen the line. It forms from the time the cart opens, and doesn’t die down until the cart leaves at 4 in the morning. Late night club goers, bridge and tunnelers, and cab drivers as far as the eye can see- sometimes stretching as far down as 7th Ave.
A lot of people see this line, and wonder “How could this chicken and rice be so good?” Not me. If somebody gets killed just for cutting in line, then I don’t question how good the food is at the front of the line. I just wonder, where can I get Chicken & Rice worth killing for, in Midtown, during lunchtime!?! The answer led me back to 53rd St. & 6th Ave., but not necessarily the corner you may think. I got it months ago on a very rainy night, so there were only 5 people in line. Carts can create a lot of confusion. They appear, disappear, don’t have websites, many look the same, and finally- oftentimes, the people who write about them, just get it wrong. 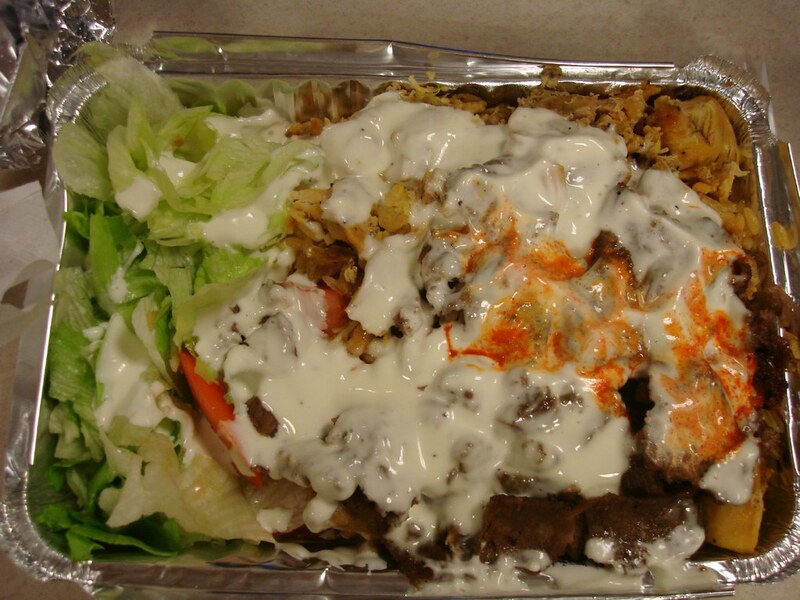 Just this week, an article was printed in the Columbia Spectator saying that the cart on 53rd & 6th was “Sammy’s Halal” the winner of last year’s Vendy Award. 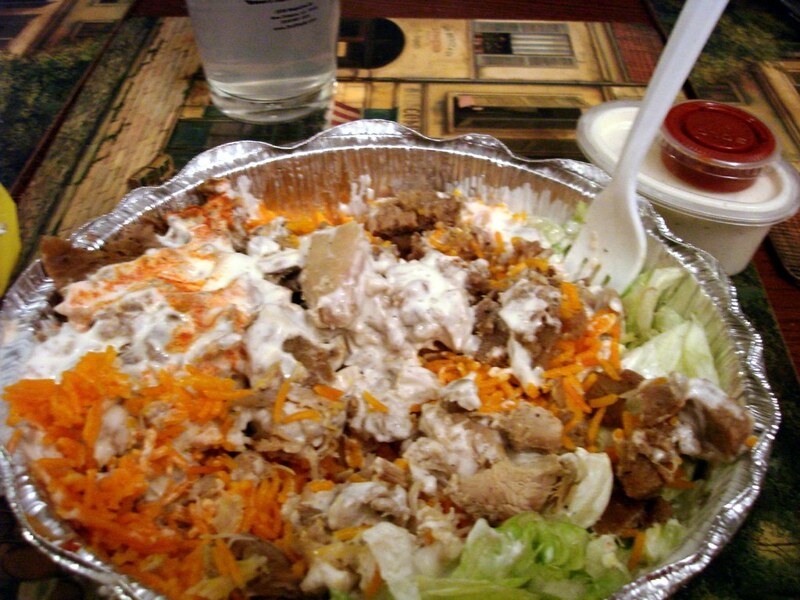 Sammy’s Halal is actually in Jackson Heights, Queens. 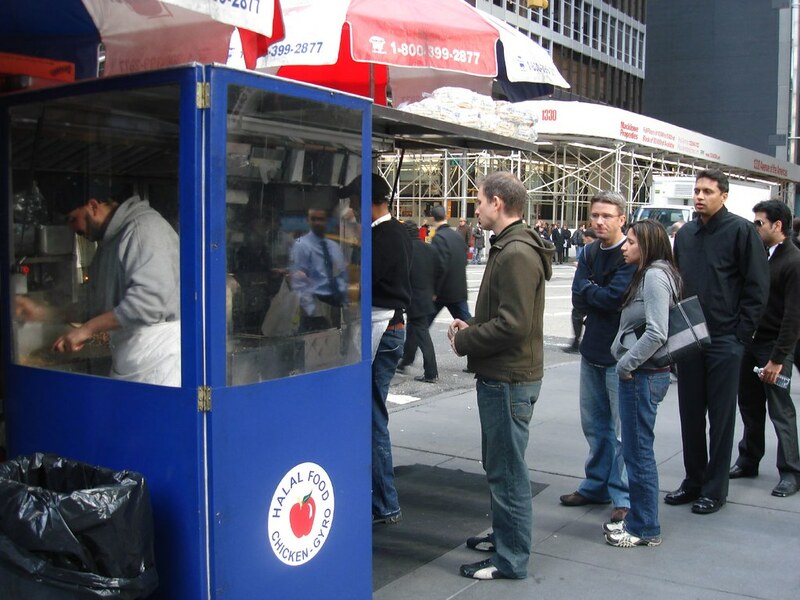 Last week, I was told by a trustworthy source, that the daytime cart on the SW corner of 53rd & 6th, was owned by the same people who owned the nighttime cart- and you could get the same food there as a Midtown Lunch. Excited, but skeptical, I went right to the source in an attempt to settle this issue once and for all. 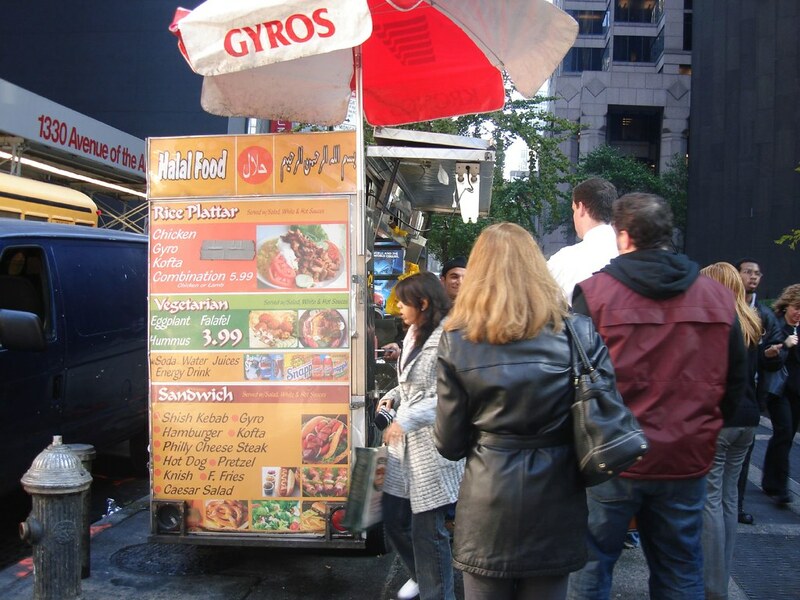 MYTH: The Cart on the SW Corner of 53rd & 6th Ave. during the day, is the same food as the cart that gets the super long lines at night. 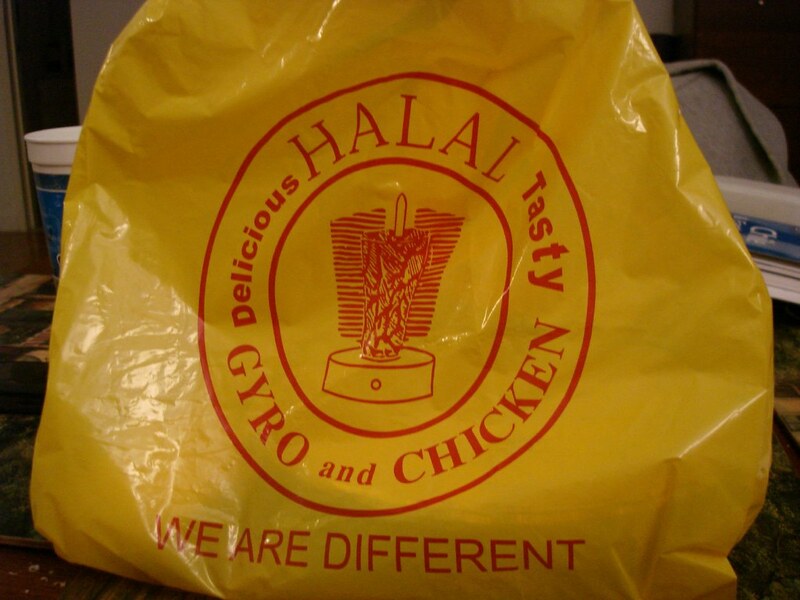 As I ordered my Chicken & Lamb over Rice combo, I asked the guy at the cart whether or not he was related to the famous cart at night. It sure looked similar. And it tasted similar too, but it had been months since my dinner at the nighttime cart, so I wasn’t positive. But there were a few obvious things that caught my eye. First, the tin was a rectangle. At the nighttime cart, they use circular tins. They also have little individual servings of white sauce and hot sauce at night. The daytime cart didn’t. And most obvious was the plastic bag. The famous cart used bright yellow bags. The daytime cart had regular old smiley face plastics. If you and your brother own a business, with the same exact food, why wouldn’t you use the same supplier of tins and plastic bags? Very fishy. That night, I returned to the SW corner of 53rd & 6th to confirm the daytime guy’s story. The famous cart arrives at 7pm to set up. Amazingly enough, even though it takes them an hour, a few people had already gathered in anticipation. I told them that the guy who parked in their spot during the day had claimed that the owner of his cart was brothers with the owner of their cart. “I don’t understand why people lie,” he replied. I understand why… Well that solves that mystery. But wait. There was more. 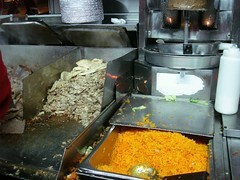 MYTH: At night, there is another cart across the street from the famous cart with the line, that serves the same food. This myth turns out to be true! The daytime cart on the SE corner of 53rd St. & 6th Ave. is there until pretty late at night. So if you find yourself in Midtown after a long night of drinking, or clubbing or driving your taxi, don’t wait in that ridiculous line. Head over to the Southeast corner and get the same food, in 1/10 the time. The REAL Deal Chicken & Rice Cart during the day. On the SE corner of 53rd St. & 6th Ave. Moral of the story. When a cart tells you something, don’t take their word for it. Just look at the plastic bags. Noon until Late night on the Southeast Corner of 53rd St. & 6th Ave.
8pm to 4am on the Southwest Corner of 53rd & 6th Ave.
UPDATE: And now they have another lunchtime cart on the SW corner of 53rd and 7th Ave.
Posted by Zach Brooks at 8:59 am, November 15th, 2007 under Cart, Famous Halal Guys on 53rd & 6th, Middle Eastern, Street Meat. I’ve started to frequent the daytime 53rd and 6th SW cart and I really love it – I can’t believe I missed out so long. Today, the other corner. I am looking to open a chicken and rice cart with a business partner this fall. I just graduated from college. Where do you think I can you purchase supplies to make a chicken and rice cart like the one on 53rd and 6th avenue in New York? I have already applied to a venders permit, I have hands on a self contained food cart, now I just need to know where to get the supplies or how to make them. Hartej.sds@gmail.com – please contact me if you have any information. For my money, the SHENDY’S cart is by far the best chicken and rice cart before 6pm, in midtown. It’s at 52nd and 6th, in front of Rochester Big and Tall… where you’ll need to start buying your clothes soon. I have a house account there. 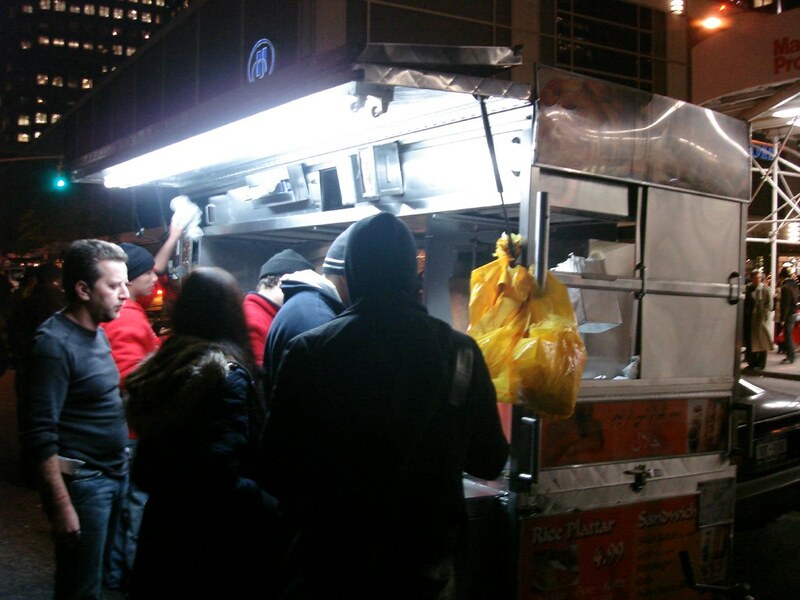 Andre (aka forknewyork) – What’s the best Chicken & Rice cart after 6pm??? I had the food, and much like Zach, I noticed all of the slight differences. The big kicker for me was the fact that I received no bread! As it turns out, it was the cart that ForkNewYork mentioned at 52nd, not the famous cart at 53rd. The food was still good, not “famous” good, but markedly above what can be found on random street corners. While I joke about getting scammed at the wrong cart, the truth is, I’d gladly make the mistake again. haha- great street meat detective work! now i really wants me some chicken n’ rice. even though it’s 10am. and i just had brekkie an hour ago. Awesome!!!! Thanks for all your hard work. How’s your stomach? wow, zach… i hope your putting some of the $$ from your ad revenue into an angiopplasty/coronary bypass fund… street meat twice in a day? you are a freaking warrior. Thank you for sacrificing for the greater good. I haven’t had the opportunity to try the famous cart yet, but I guess that will change now. The best after 6pm is the 53rd and 6th…. if you can stand the long line. I need to try the other cart! SE Corner of 53rd & 6th During the Day = SW Corner of 53rd & 6th after 8pm. SE Corner of 53rd & 6th = best chicken and rice before 6pm!!! I frequently eat at the 53rd and 6th SW cart. Delicious! 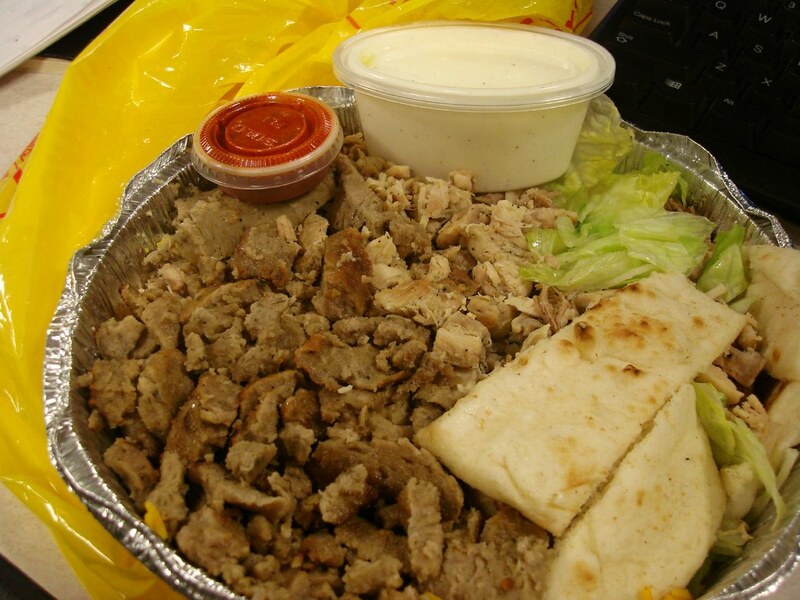 Nothing like chicken and lamb, rice, “salad”, white sauce, hot sauce, and pita for $5. Strange, but their tomatoes are really great quality. They are actually red through and through and have some flavor unlike so many other tomatoes I have had at generic midtown delis. The “famous” cart and its SE corner sister have the best chicken, hands down. Tastes like the kind of chicken you’d find in a good Jewish chicken soup. The cart on the SE corner does not give you white sauce/hot sauce in separate containers. The hot sauce is fiery hot, unlike a lot of the other nearby carts; I stupidly asked for more. THe healthy way to soak up the xmas party booze. Zach = as I write this, the summary at the end of your article mentions a cart on the **NE** corner, but your article is about the carts at the SE and SW corners. Can you recheck this? Hype – i frequent the King Tut cart, but only because it’s right downstairs from my office, and the wait is never more than 5 minutes. their street meat is nothing special… the meat itself is ususally pretty decent, but the “salad” is always pretty wilty and lousy. that said, i still go there once a week or so, which says a lot about my personal issues with laziness. in short, it’s better than the other street meatiers on that corner, but you might as well walk a couple blocks for the good stuff, if you’ve got the time.